Ask any Chemburite about Bhat Vishranti Gruha, Vig refreshments or Sainath Dhaba, if you get a quizzical look then it is ok for you to feel sorry for them as they have been missing out on some good things in life. Actress Vidya Balan will surely be able to vouch for these for a Chembur girl at heart she is. And for those who have not heard of these then please read on for a brief account of these destinations. 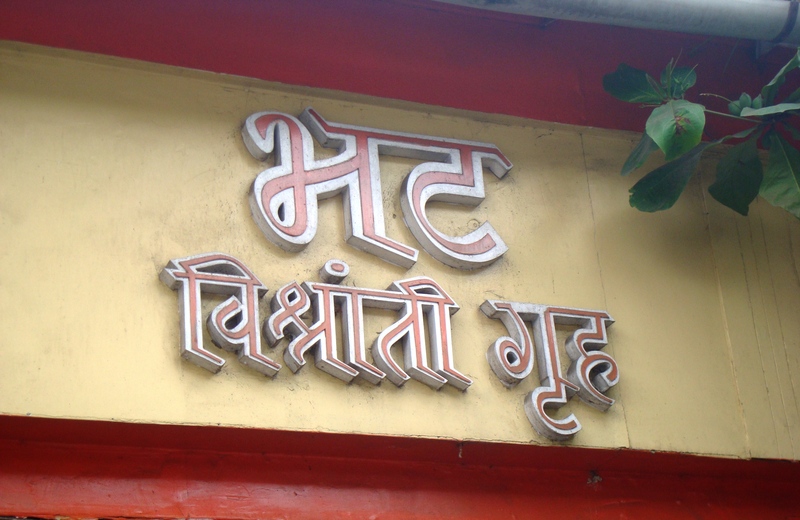 Situated right at Chembur naka; it is very easy to miss this place as the name signage hides behind a tree. When lost, ask for “ Bhat Misal” and all fingers will point at one direction. I managed to reach this place at 7 in the morning while on my way back from Goa and was greeted by a heavenly aroma of garlic tempering and spice. I was prompt enough to order myself a “Sangam” (a combination of curry leaf and ginger flavoured potato sabzi and White pea Usal) and kadak pav. The chilli in there woke me up rather shook me up and I was charged up for round two with a Misal . 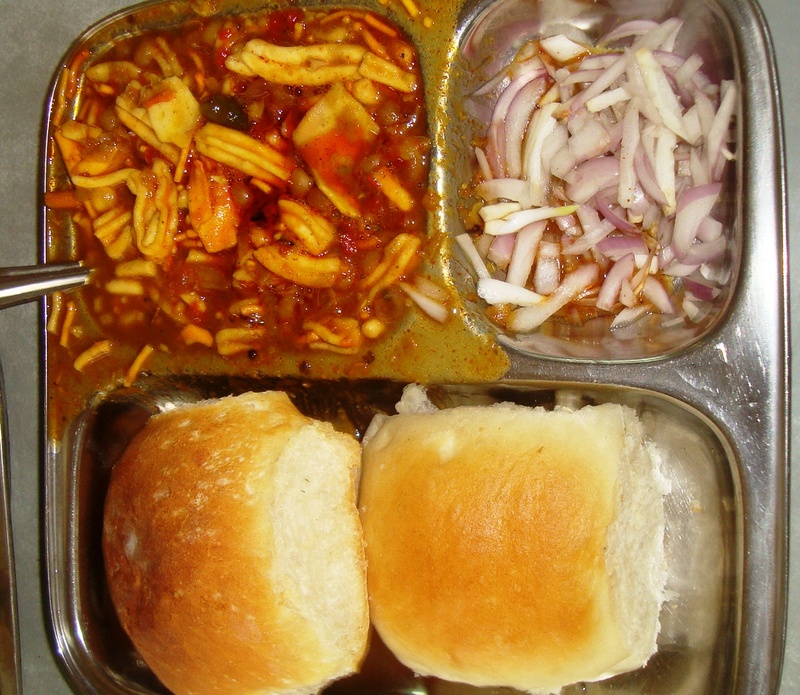 Misal Pav….. Tari is the layer of oil on the surface of the Usal. Purists will never acccept a Usal without Tari. The heat was there but never over powered the flavours. With “Rs 12 bharpet khana” doing rounds, this place can cost you Rs 100 for 2, expensive huh! They also serve you some other Maharashtrian delicacies like Sabudana wada and sheera for those who do not dare to sweat it out! Standing there for over 5 decades, this place has been the all day diner for the locals, people in transit, celebs from RK Studios or people like me who pay homage once a month at-least. Located in Chembur camp, this place is by aesthetics and visible hygiene is surely avoidable but if you can manage to look beyond, it is food which will draw you there. Vig is known for its Dal Pakwan , “the most amazing chole in Mumbai” as some Punjabis would swear by and Pattice (Aloo tikki). I ordered a Dal Pakwan, as Sindhi breakfast specialty, essentially spiced Chana dal (Split Bengal Gram) and Hard yet crisp flatbread made of refined flour. Our dal came topped with some Pickle which made it piquant and different, I polished it off in no time and tried my best but could not finish the Pakwan as it proved to be very heavy. In no time came the Pattice chole, two pieces of heart-shaped aloo tikkis stuffed with chana dal Shallow fried to a gold brown colour and served with mildly spiced chole (chickpeas) topped with sliced onions and green chutney. I was slightly high on food with both these dishes, but it was time to get sloshed with a pint full of lassi and I did just that. A meal for 2 people comes under Rs 150 and yes please ensure you reach the place before 11 am for Dal Pakwan. At a stone throw from Vig; this place is more of a take-away than a dine-in place. You have to see it to believe it as to how a 4 cover eatery caters to dozens of patrons waiting in the comfort of their sedans. The father-son duo has been pulling off the entire show with great ease. 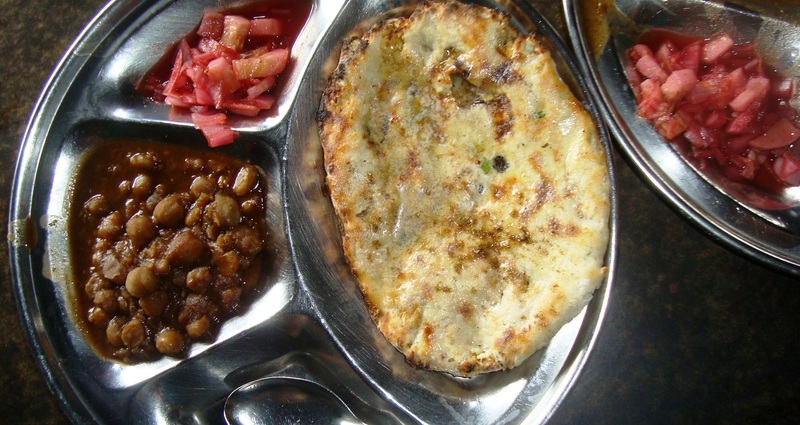 The menu is very simple, Amritsari Kulchas and Chole served with sirke wale Pyaaz (Onions soaked in Vinegar), although these days it’s cucumber that has replaced the onions. I ordered a Paneer and Cheese variant and trust me; never have I have bit into one in less than 15 seconds after it came out of the tandoor (clay oven). It is finished with copious amounts of butter and a generous sprinkling of coriander powder. The coriander really helps to accentuate the taste and give the plain simple Kulcha another dimension. A meal for 2 again will cost you less than Rs 150. A must try when you are that side of town.